Over the past several decades, the word 'implosion' has been used to describe almost every type of explosive demolition project. 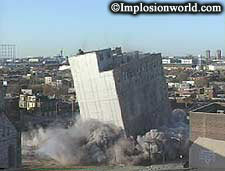 Whether due to convenience, or to the absence of any word that accurately describes this type of activity, 'building implosion' has been the title given to thousands of projects involving explosives. 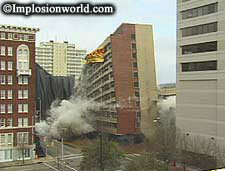 DID YOU KNOW that only a small percentage of explosive demolition jobs are true 'building implosions'? Webster’s Dictionary defines implosion as "a violent collapse inward". In the demolition industry, a blaster is usually trying to pull a structure away from adjacent exposures and towards an area large enough to contain the debris. Therefore, the only time a building is truly 'imploded' is when exposures (other structures or areas of concern) completely surround it. When this situation exists, the blaster has no choice; he must make the building collapse in on itself. This is by far the trickiest type of explosive demolition project, and there are only a handful of blasting companies in the world that possess enough experience—and insurance—to perform these true building implosions.